Now that I've wrapped up a year of food charts, it occurs to me how much of what I eat and what I cook have to do with what I publish. I mean, right? I have this editorial calendar, which means this shooting schedule, which means this cooking plan, which means this food that I eat. More about this later, but I was reflexively planning—just in my head, not on paper or anything—what I was going to cook when, next year, and had an epiphany that I don't have to write about food next year, of course not, I don't have to do anything. It's just that writing about food has been going on for a long time for me, circumspicere, how far does this blog go back? Geez, 2009. That's like five years. Of photographing my food before I eat it. Of that, really it's been the last two years that I've been seriously developing these food charts. Which is still a long time, long enough that it was a slow realization that eating and taking pictures could be unhitched. And that eating might flower into something totally else with that freedom, kind of like, well, I did. When I got unhitched. I had sort of a car wreck of a week last week where I managed to make all the food on the chart, but then did not want to eat any of the food. I just couldn't face microwaved eggs at work, and idk what but the slow chicken I made last week was just gross. Meat, greens, and quinoa were fine. So today started with taking stock: I still have four shakshuka jars in the fridge and I still don't think I can face microwaved eggs so it's going to be peanut butter apples for breakfast. 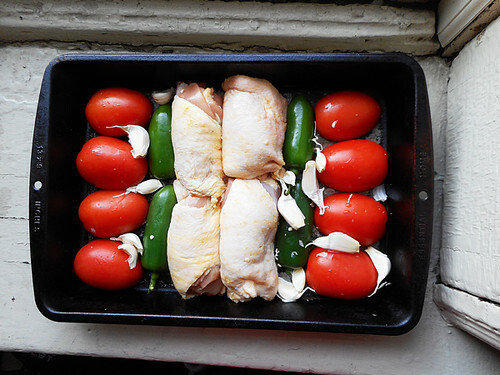 And bleagh last week's chicken really put me off slow chicken, so it's going to be baked chicken shakshuka, hey-o, for lunch. I have roasted edamame, almonds, and cashews for afternoon snack. And the sweetie man's made spaghetti with meat sauce for the past two weeks and there's plenty of meat sauce left over, so that will stand in for meat and all I need is greens and starch. Oh first of all, I made sweet clafouti with fresh apple for breakfast and put the peels in the toaster oven for crispy apple sticks. And then I got sidetracked setting up my old R3s for a recruit who wants to borrow them for tonight's clinic. In fact I need greens now-ish, I finished the greens in the fridge on Thursday. So first thing is I put some water on to blanch the kale. 2. 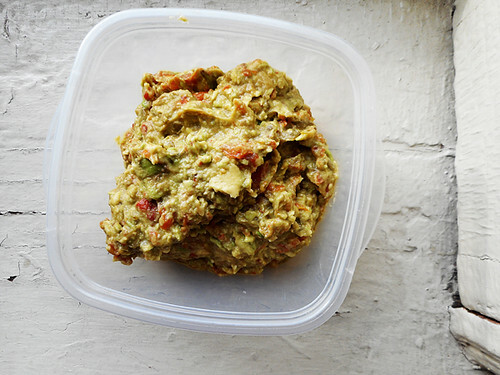 Bake chicken, and also tomatoes, garlic, and jalapenos for guacamole. If you're wondering how big my oven is, it exactly fits a 13x9 baking pan and four baking potatoes. I figured that sounded good for dinner, baked potatoes with meat sauce and kale. I got the idea from Food52. And now the apple sticks are done, because life is good like that. Brb! Okay so, the potatoes are in little foil jackets in the fridge like Food52 said to do. The chicken I cut up and filled two pint mason jars, it may or may not be enough. I may have snacked on a couple three all of the crispy chicken skins, what, they don't keep and they're yum. Not to be disloyal, but I have a feeling this isn't the only green we're going to be eating tonight. PROVE ME WRONG, CUTLER. Finalmente, I decided to toss the blanched kale in the remaining chicken fat and tomato-jalapeno juices and finish it in the oven. I just took a peek at that and some of the top bits had crisped up like kale chips, that's not going to keep either so yum. Sheesh, life is time-consuming. Just enough time to get the kale out of the oven and wash up for LTS and referee practice tonight. At least I've snacked enough, I think I'm okay on food!